My future classroom will be one that welcomes everyone. I want my classroom to be open to all cultures, beliefs, and ideas. I want every person who walks in my room to feel comfortable and safe, so that they can learn best. I want students to feel comfortable asking questions, so they can learn the best! I want students to be able to have access to any tools they need to help them learn. I am a secondary student but the grade level I would most like to teach is grade eight. My grade eight room would have computers for every student, all the same so they are working with the same thing. There would be a smartboard, and all of the notes and lessons I would teach would be done so digitally. There would be a bookshelf that covers an entire wall of the classroom, with books for every reading level and interest! There would also be a catelog for those books so that each student could look at it for a reference when they were looking for a book! There would be individual desks, not tables, which would get moved around frequently… from pods, to a circle classroom, to many different shapes to keep the classroom interesting, and see which format they would learn best in. There would be a water fountain in the classroom as well as a bathroom… so getting a drink or going to the bathroom wouldn’t disturb class. There would be a class wall, that was covered in material and paper that the students could write or draw on… so they could work on something together as a class. Another wall would be a giant bulletin board where the students work would be posted. The tiles on the roof would all be painted… it would be the first assignment in their art class. They would get to design and paint their own tile, so they can feel that the classroom is really their own and they make an impact on why it is their own. Over the semester they could add to their painting if they wanted to. Every subject would incorporate technology some way… from a type of presention, to blogging. My class will post their projects on the internet. 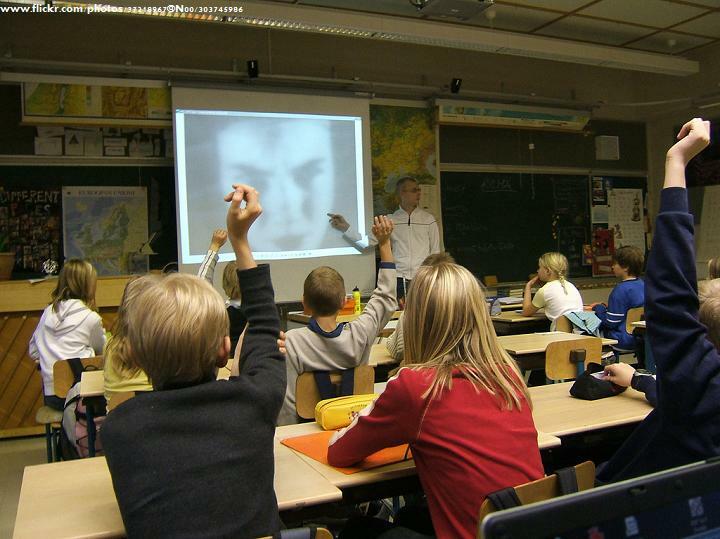 The classroom would have a camera as well as a video camera. The camera would be used throughout the semester to document the changes made in the class, as well as take snapshots of memorable moments. The video camera would work the same way, to document the class as well as video projects. At the end of the year a slideshow or some kind of presentation would be made to recount the entire year for the students. My classroom will have lockers, because it is important to start using one before highschool. There also has to be lots of windows, even though i seem to have all my walls used up, because there needs to be a link to the outside world. The classroom will have a cd player, as well as many many different cds so that students can work with music. I wont have a desk. I will have file cabinets to put my stuff on, and supplies and stuff will be open for everyone to use in an organized way, but i will not have a desk. I want to be active throughout the classroom as much as I can. There will be a HUGE recycling can, because they will know you don’t waste you recycle. There are so many things I would want in my classroom, but the main thing that is necessary is the first point. The class could be filled with millions of learning tools, and everything possible… but if my students don’t feel comfortable they won’t want to come to class. I want to give students a reason to come to school, and the classroom is the first part.